Energy - increased Protein - appropriate for growth, pregnancy and lactation Minerals - increased Food intake - reduced due to higher calorie density Produces acidic urine Science Plan Kitten supports urinary tract health by controlling mineral levels and urinary pH, thereby aiding in the prevention of clinical signs associated with feline lower urinary tract disease (FLUTD). Growing kittens. Science Plan Kitten is formulated to meet all the nutritional requirements of the growing kitten from weaning until maturity at 12 months of age. Pregnant and lactating queens. Science Plan Kitten also meets all the nutritional requirements of pregnant and lactating queens. 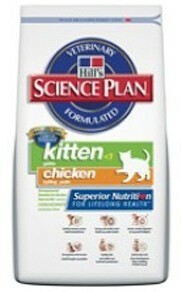 Science Plan Kitten also contains a Superior Antioxidant Formula to reduce oxidative cell damage. NOT RECOMMENDED FOR Long-term feeding to adult cats, unless they have higher than normal energy requirements. PACKAGING Bags: 500g, 2 kg and 5 kg and Kitten with Chicken also available in 10kg.